Republicans were already worried that allies like the European Union, Canada and Mexico have begun to retaliate for U.S. tariffs on steel and aluminum imports. 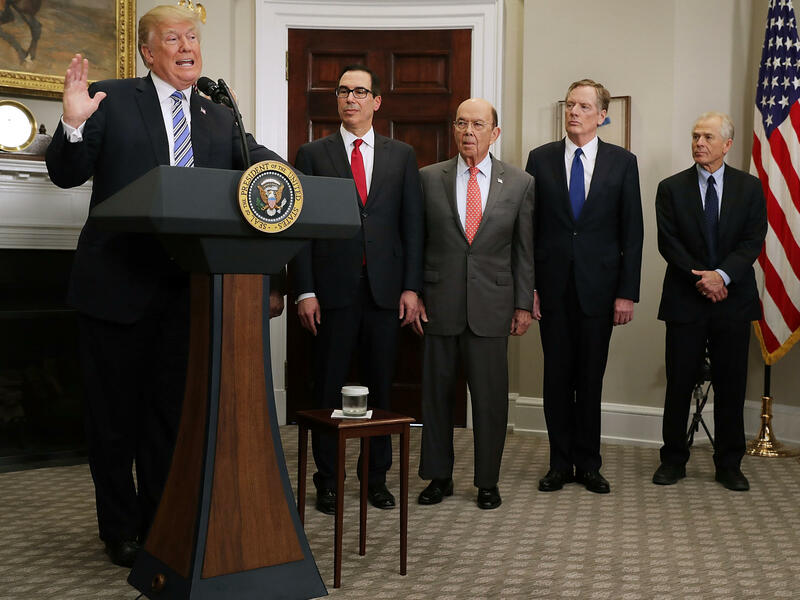 Now they say they fear even more blowback as the Trump administration imposed another $200 billion in tariffs on goods from China. The Senate voted 88-11 to constrain presidential authority to use national security as justification for taxing foreign goods, but the measure was nonbinding. While some in Congress are agitating for even stronger responses, most admit there is virtually nothing they can do to stop Trump from waging a trade war. Sen. Bob Corker, R-Tenn., one of three Republican co-sponsors of the Senate measure, says he is frustrated that the White House seems to lack a strategic, long-term policy for addressing legitimate imbalances with trading partners. "It's just ham-handed, it lacks any degree of coherency," Corker said. "What I do know is that Americans are being hurt by the fact that there is no coherent policy here." Unlike Corker, who is retiring at the end of this year, many Republicans worry that the trade fight could have a serious impact on their re-election chances in November. A growing economy and the success of last year's tax cuts are two centerpieces of GOP campaigns across the country. But even some former Trump administration officials say tariffs could reverse any new economic growth. Gary Cohn, Trump's former National Economic Council director, warned last month that a trade war could wipe out any gains created by the tax cuts. "If you end up with a tariff battle, you will end up with price inflation, and you could end up with consumer debt," Cohn said at a Washington Post event in June. "Those are all historic ingredients for an economic slowdown." Corker and his co-sponsors say they want to introduce a binding version of their bill that would give Congress final say over national security tariffs, but Senate leaders are skeptical. The No. 2 Republican in the Senate, Majority Whip John Cornyn of Texas, told reporters on Thursday that Trump doesn't want Congress to tie his hands in trade negotiations. "Many of us don't really see the benefit of getting into a big public fight with the president over this issue," Cornyn said. "There are other ways we can handle it, I think, that would make the point." But it isn't clear what those other ways might be. Some legislators, like Rep. Bill Flores, R-Texas, have suggested that companies could apply for waivers that would exempt goods they import from some of the tariffs. "The best thing we can do is to work with the administration to try to go through the exceptions process," Flores said. "Make sure that those are heard quickly." Commerce Secretary Wilbur Ross told members of the Senate Finance Committee last month that the department had already received about 20,000 requests for exemption from the steel and aluminum tariffs. At the time of his testimony, the Commerce Department had granted 42 waivers and denied 56 — meaning less than one half of 1 percent of the applications had been processed. But, he said, he is telling them to hold on and be patient. "You don't win a war overnight," Collins said. "We've been in the war, the battle, for trade for a long time. We've been losing that battle, and all of a sudden, we have a president who is standing up for America and it's noisy."